Published: Oct. 3, 2014 at 03:17 p.m. Updated: Oct. 3, 2014 at 07:11 p.m.
We did it. We survived the first epic bye week of the year, and now a wealth of fantasy studs will be back in action. Below is a look at whose stock is rising, and whose is falling, as we approach Week 5. Keep an eye on these players heading into Sunday to help make the right choices for your fantasy lineup, as their stock could be on the move again before kickoff. Lacy owners had rightfully been panicking after he failed to rush for more than 50 yards in any of his first four games. 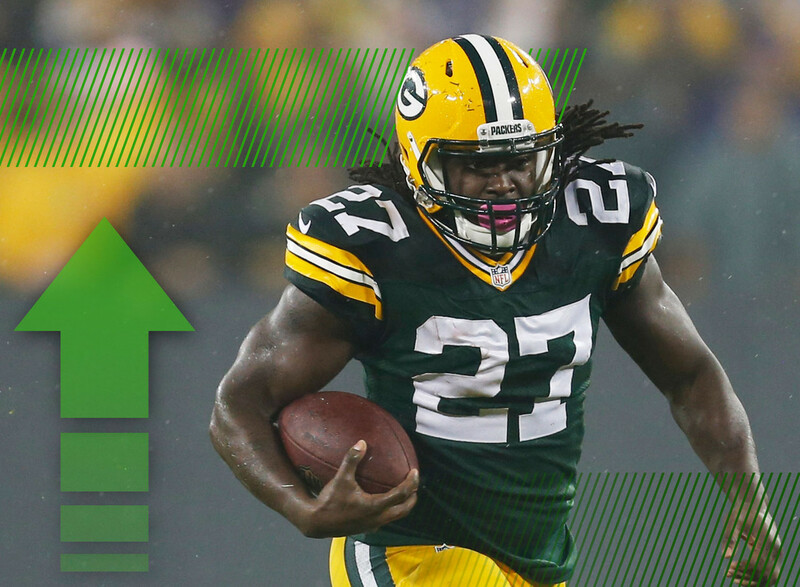 Well, that changed in a hurry on Thursday night, as Lacy rushed for 59 yards in the first quarter alone. The big back looked more confident, trusting his blockers and making appropriate reads to burst through the holes. And once he was loose, he punished the Minnesota defense for yards after contact. It was one week, but Lacy looks like he's back. I normally don't include players from the Thursday night games in this column, but the differing trajectories of Lacy and Patterson needed to be mentioned. While Lacy broke out, Patterson broke down, suffering a hip injury and only collecting two catches for eight yards. Patterson said after the game that he wants to be more involved but whether it's because he's not fully into the playbook or just unable to beat his coverages, the second-year breakout candidate is looking like he might be mired in a sophomore slump. Johnson was severely limited last week due to an ankle injury (only posted 1.2 fantasy points), but things are looking up as the dynamic receiver practiced on Friday with the first team. He'll still need to be monitored heading into Sunday as head coach Jim Caldwell has said they will sit Johnson if his injury worsens, but practicing on a Friday is an encouraging sign as he heads into a potentially favorable matchup. On the flipside, Decker continues to struggle to recover from his early-season hamstring injury. He missed practice this week, and Rex Ryan said early on Friday that Decker will be a game-time decision. Even though Decker found the end zone last week, until his hamstring is in better shape your fantasy team will be in better shape if you leave him on the bench. Heading into the Cardinals Week 4 bye, Carson Palmer was hinting that he could be assuming his starting role once again in Week 6. Well, another setback with his shoulder has raised the stock of Stanton, who has been improving each week he fills in for Palmer. If Stanton can deliver a win for the Cardinals on the road in Denver this week, he might be keeping this starting job a little longer than expected. Palmer suffered a setback with the nerve injury in his shoulder, but after visiting a specialist he was told that the injury is not season or career-threatening. What is career threatening for Palmer is the continued improvement of Stanton. Week 5 will tell us a lot more about this quarterback situation. A third-year undrafted free agent, Davis had been on borrowed time as the starter for the Rams while Shaun Hill recovered from a thigh injury. Well, head coach Jeff Fisher has announced that Davis will continue to start for the Rams, even though Hill is healthy once again. This makes Davis one to watch if you're streaming quarterbacks or are in desperate need of a signal-caller. He's coming off a 20.98-point outing against the Cowboys, and faces the Eagles' suspect secondary in Week 5. Hunter was one of the darlings of the offseason, but the second-year wideout has struggled mightily in 2014. Part of that has been due to erratic quarterback play, but even when they have put the ball in Hunter's hands he's dropped his fair share of chances. I've already dropped Hunter in a few leagues, and would suggest you do so as well. There are plenty of better high-upside guys to have on your bench than Hunter. Another offseason hype bunny, Sankey was probably over-drafted in a number of leagues, and his owners have been rightfully frustrated by his lack of not only production, but time on the field. Well, that figures to change as head coach Ken Whisenhunt has stated that he's going to increase the rookie's touches. Just in time, too, as he has a very favorable matchup on Sunday. After stumbling ineffectively through the first few weeks of the season with an injured ankle, Gerhart has started losing snaps and touches to Denard Robinson. This is not a good sign for the Stanford product, as many had this pegged as a breakout year for him. Between bad offensive line play, a budding committee in the backfield and a bum ankle Gerhart's stock is plummeting. Ivory has been running hard for the Jets, and earning more touches and playing time as a result. He's clearly the most dangerous back for the Jets, and will be a key to keeping opposing pass-rushes from flustering Geno Smith on a regular basis. The crowded committee in New York is starting to become a lot thinner as Ivory separates himself from the pack. Johnson found the end zone last week, but aside from that 35-yard scamper he wasn't very effective the rest of the time. Ivory is clearly the best back for the Jets right now, and the team could start feeding him more and more. Unfortunately for Johnson owners, his inconsistencies make him nothing more than a risk-reward option until he proves otherwise. With rookie Mike Evans sidelined for a few weeks with a groin injury, Murphy could see his role in the offense increase. He caught six passes for 99 yards in the Buccaneers' surprise win over the Steelers last weekend, and with Saints safety Jairus Byrd heading to injured reserve, Murphy might be able to find some nice openings to exploit on Sunday and duplicate (or exceed) that production. After coming out of the gates hot in the first two weeks, Foster has cooled down significantly as he's fighting off a nagging hamstring injury. Now, he's not even sure if he'll play on Sunday. Owners should have other options waiting in the wings -- like Alfred Blue if he's magically still available -- in case Foster sits or is limited again.